A measurement device for the Optikos I-SITE™ system is the part of the test equipment that acquires the image or signal from the system under test and transmits it to the computer for analysis. An optical measurement device is used in an electro-opticalimaging system where the output of the unit under test is an optical image, such as adisplay device. Conversely, an electronic measurement device is used in an electro-optical imaging system where the output is an electronic signal, such as a CCD camera. 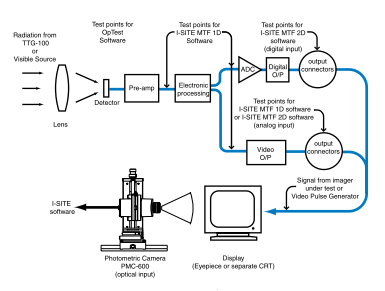 For a system under test that outputs its signal to a display device, such as a CRT or LCD, an I-SITE system uses the PMC-600 Photometric Camera. The PMC-600 acquires a 2-dimensional image produced by the system being tested. Three software and hardware products are offered: I-SITE™ MTF 1D acquires a single video line from either 1D or 2D analog cameras, MTF 2D Analog acquires the 2D image from the video signal of an analog camera, and I-SITE™ MTF 2D Digital acquires the signal from a digital camera. 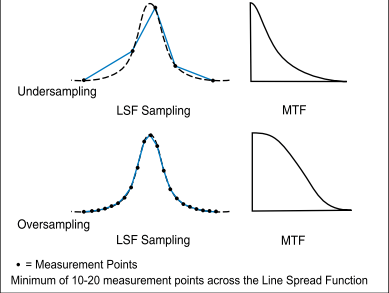 Oversampling ensures accurate LSF and MTF measurements. I-SITE™ system measurement devices can measure an electro-optical system at multiple points along the signal path. As a general rule of thumb the I-SITE™ system oversamples the unit under test by a factor of ten. That is to say,in making MTF and LSF measurements on a CCD array or other camera,the image of the slit should move across the face of the detector in steps no larger than 1/10 the dimension of the detector.Oversampling the signal from the unit under test assures accurate characterization of the signal.This is achieved electronically by using a high sampling rate,and is achieved optically by magnifying the image using a suitable lens.